February is coming which means National Pet Dental Health Month is on its way too. This month is all about creating awareness that dental health in pets is very essential and it helps to prevent them from so many diseases. If you haven’t ever celebrated National Pet Dental Health Month till now, fret not, it’s never too late to do so. Why Celebrating National Pet Dental Health Month is Important? There’s a lot you can do for 28 days, and we’re here to help you celebrate February with your pet the right way. Here are a few reasons why celebrating such a month is essential. Plaque develops in and around the teeth areas if proper dental care isn’t maintained. Over time, this builds up leading into tartar and gingivitis, which can develop into periodontal disease and can become very difficult to cure. Hence, dental care is necessary. Most, if not all dogs have a weird smell coming out from their mouths when regular dental health isn’t maintained. Hence, regular dental care is very essential in maintaining proper hygiene and good breath. We all know how painful a loose tooth can be, don’t we? A loose tooth can not only cause discomforts but makes it difficult for your pal to eat and chew his food. Thus, dental care is so important to lower the risks of a loose tooth. If you want your buddy’s teeth to look as white as snow and simultaneously want his gums to be healthy, then regular dental care is the answer to your wants. Make sure you celebrate National Pet Dental Health Month by taking your pal for a dental check-up. Did you know that if you maintain proper dental hygiene in your pet, you prolong its lifespan? Well, yes that’s true. Cleanliness and proper dental care lead to a healthier and longer life. So, get ready to spend National Pet Dental Health Month the way it should be spent! Last but not least, maintaining proper dental health will benefit you. Yes, you heard us. Regular dental health assists you in protecting your pal from the harmful teeth problems which in turn saves you the big bucks on continuous vet visits and treatment costs. 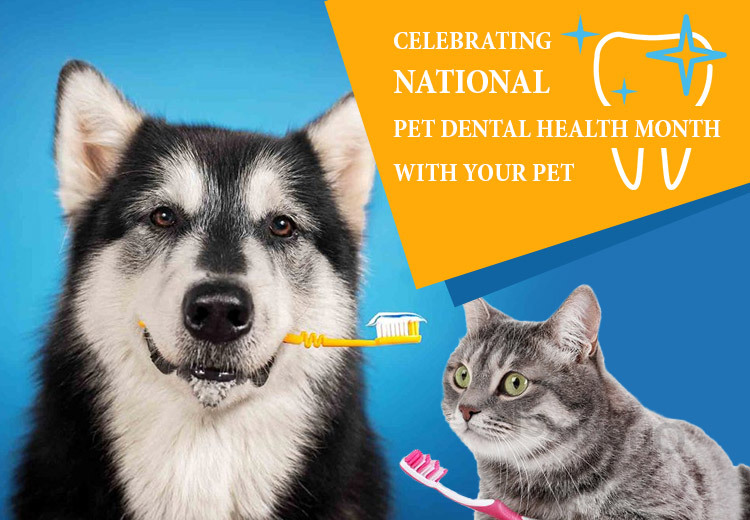 So now that we have given you reasons to celebrate National Pet Dental Health Month, we hope you will take part in this great cause and not only protect your pal from teeth issues but spread awareness that pet dental health is equally important and shouldn’t be neglected.